Pablo with a confiscated owl-faced monkey (from east of Congo-Lualaba). Pablo was born in Lubumbashi on 5 September 1981. His father was a dress designer and his mother was a saleswoman. When he was 2-years-old, his family moved to Kisangani. He is a first-born child with 6 brothers and sisters. The person who motivated him was his paternal uncle, a biology teacher, specialized in Botany. 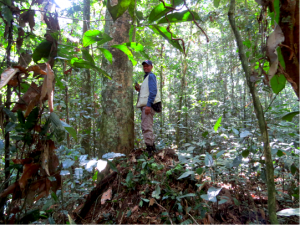 Sometimes, during his studies in Medicine, Pablo accompanied him on his field trips to collect plants, and that is where he became passionate about biology and fieldwork. 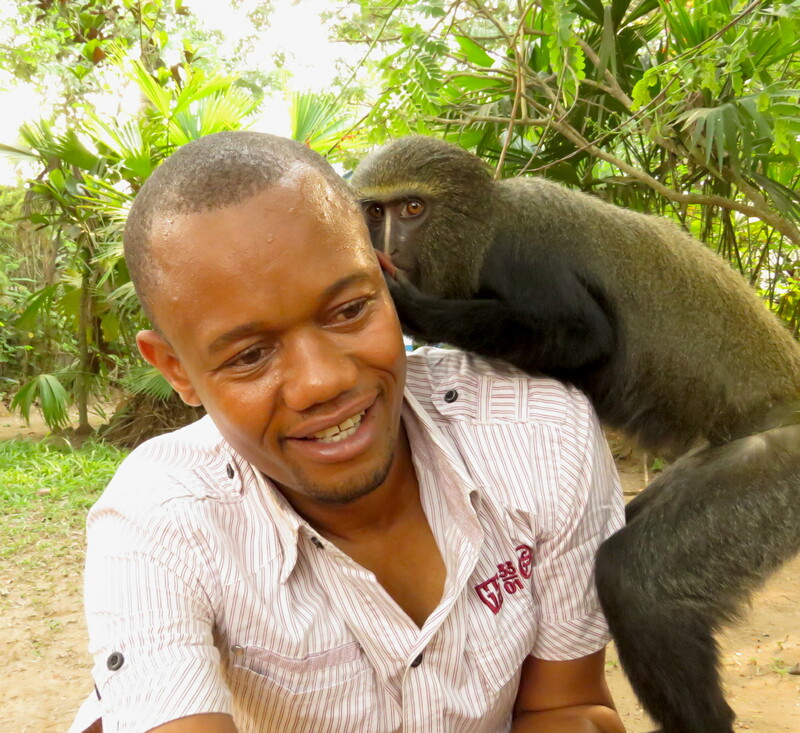 He was still a Botany student in 2011 when he joined the TL2/Lukuru Project as a 3-month intern. 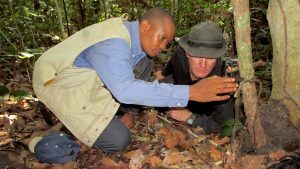 His first job for the project was to collect and identify the plant species consumed by bonobos. Setting up a camera trap with John. 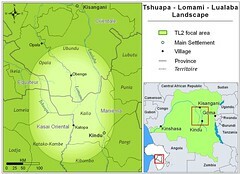 After he graduated from the University, he became a team leader for the TL2/Lukuru Project. He organizes field missions, data collection, and data treatment and analysis. He is also familiar with mapping and ArcGIS. 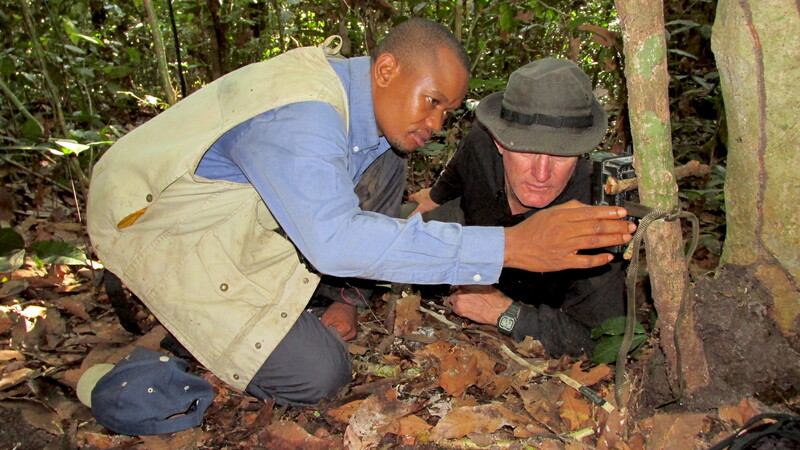 He takes part in planning the forest survey transects together with the project’s scientific director, John. He spends the majority of his time in the forest. 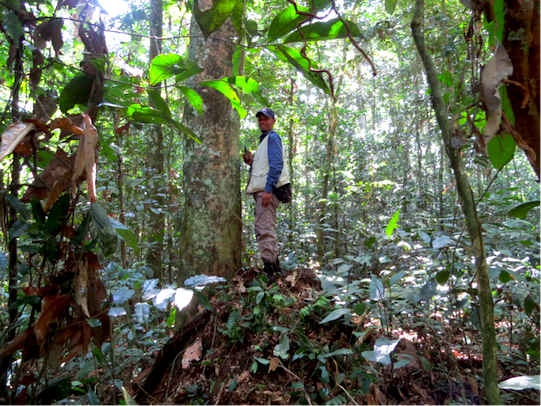 Pablo really enjoys working with camera traps. He says: “This way we get to observe animals that live a very discrete life. For example the lesula – the monkey discovered by the project – is incredibly difficult to see, but we have some nice camera trap footage of this species.” Pablo is excited though by what he can see without the camera traps. On a recent mission he was able to watch and photograph a lesula for the first time with a hand-held camera. He hopes to continue studies at the PhD level specializing in analysis of camera trap data, and coming back to work in conservation. Pablo has 2 children, who live in Kisangani. Being a first-born son, he also supports the studies of his two youngest siblings. Unfortunately he doesn’t spend much time with his family, but he says his wife accepted this lifestyle, and they are happy together.